5. Levi Potter b about 1792 NC d 1886; m. about 1810 Clay Co KY to Jane Hollingsworth b about 1794 Ashe Co NC d about 1840 Clay Co KY; d/o Vincent Hollingsworth and Mary Beasley. 6. Richard Potter b 14 Feb 1792 NC d 29 Dec 1882 Pike Co KY; m. 20 Jan 1826 Pike Co KY to Mary Christina "Teeny" Ramey b 1803 d 1863 KY; buried Elkhorn City, Cemetery, Elkhorn City, KY in an unmarked grave; d/o William Ramey and Anna Samlins. Richard Potter m. (2) to Mary Polly Wallace. 7. Jane "Jenny" Potter b 1793; m. 7 Sept 1831 Perry Co KY to (1) Thomas Stewart b abt 1766 NC. 8. Benjamin Potter b about 1796 NC d 1870 KY; m. about 1816 (1) to Susannah Hollingsworth b about 1794 NC d 1859. Benjamin Potter m. about 1860 (2) to Mary Polly Lunce. These are the GGG Grandparents of Linda Potter Whitt, Janet Potter Stern, and Victor "Vick" Potter, Hazel Potter Thompson and the GGGG Grandparents of Willard Mack Wright. 9. John Potter b about 1799 NC d 1854; buried Sutherland, Ashe Co NC in the Potter Family Cemetery. Purchased land from Isaac Musgrave 28 Feb 1833, which is where Charles Ruffin Potter was born and later raised his own family. He married unknown. From the research of Vernon Hopson submitted 2 June 2006. These are GGGG Grandparents of Vernon Hopson and Connie Hopson Damron. Son of John Potter; i. Johnson O Potter b 20 Aug 1818 Ashe Co NC d 13 Dec 1888; m. Susannah Susan Main b 13 May 1821 NC d 22 Apr 1907 Johnson Co TN; buried Old Potter Cemetery, Mountain City, Johnson Co TN. 11. Abraham Potter b 1804 NC d 1880; m. 10 Feb 1827 Clay Co KY to Martha Patsy Hollingsworth b abt 1815; d/o Beasley Hollingsworth and Mary Polly Unknown. Child of Abraham Potter Jr and Patsy Hollingsworth; i. Richard Potter; m. Nancy Stuart (aka Stewart). In many genealogies it is often recorded that Jane Potter, daughter of Abraham Potter Sr., b. abt. 1815, was married 1st to Thomas Stewart, and second to Owen “Ode” Mullins. In actuality, there were 2 Jane’s of that time and it is easy to see the confusion. Hopefully, this will help set the record straight. Jane 1 (1793 also listed as b 1815), was the daughter of Abraham Potter SR. and born about 1815, although I think perhaps earlier. In 1829, Pike County, Ky. Court Records (Book 211a) report that a Jane Potter and Thomas Stewart were summoned to the Court to “show cause as to why their children should not bound out”. This was a political move by the County in an effort to “clean up the County of folks who were living out of wedlock and producing offspring”. Book 211a has lots of folks we will find familiar to us, who were caught up in this cleansing of the County. Jane1 would have been abt. 14 at the time of this case. Because the Court said children (Plural) I think perhaps Jane was older. When Thomas and Jane’s case came before the Court, they were “no shows” and it was reported by the Sheriff that they were no longer in the County. The case was dropped at that point. One year later, in 1830, Thomas Stewart and a Jane Potter1 were married in Perry County, Ky. They lived in Clay County, Ky. for a while and eventually returned to Pike County. Thomas Stewart is likely the brother of Lydia Stewart who married our own Abraham Potter SR. Thomas was born abt. 1766 in N.C. Wherever Abraham and Lydia are found, Thomas is close by. 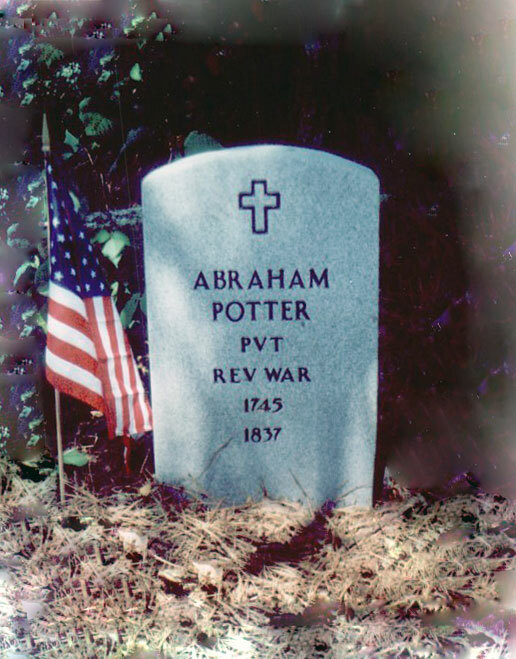 Abraham Potter Sr’s Revolutionary Service was based in part on 18 months he served in place of David Stewart. It is likely David Stewart was Lydia’s father. Thomas claimed he served as a soldier during the Revolutionary War and his name appears on the D.A.R plaque on the Courthouse grounds of Pike County along with our “Abe”. After Thomas’ death, Jane 1 submitted for his Revolutionary War Pension. It was denied. The reasoning was based upon the Government being unable to reconcile his birth date. A second plea was filed with an included letter from Thomas May, Clerk of Pike County, KY. stating the events of Thomas’ service was true as he knew them and that Jane was old and indigent and without any support. The application was again denied. Jane 2 (Lydia Jane Jennie Potter b 1828) is the daughter of Abraham Potter Jr and Martha Hollingsworth. They had 2 known children: A son Richard and a daughter, Jane. In Runyon’s Pike County Marriages, a line by line replication of the Marriage Records of Pike County, Jane Potter and Owen Mullins were married on October 11 of 1846. Surety’s for the marriage bond include Abraham and Richard Potter. Request for marriage by William B.H. Mullins, father of Owen. Jane is listed in her early 20’s on the record. Abraham’s presence on the bond, is clearly not Abraham Potter Senior, who passed in 1837. Backdating Jane’s age: places her birth about 1824 and provides proof this is not the Jane Potter who was summoned to court in 1829. Jane 2 would have been about 5 years of age. Last but not least, Owen Mullins and wife Jane Potter are listed on the 1850 Pike County Census. They left Pike County about 1853 and appear on the 1860 Kanawha County, WV (then Va.), as evidenced by several children’s births recorded in Kanawha County after 1853, my Great Grandfather McClelland being one of them. At the time of Jane 1’s filing for Thomas Stewart’s: pension in Pike County, KY, Jane 2 was living in Kanawha County, WV. Jane Potter Mullins passed sometime prior to 1896. A marriage record for Owen Mullins, age listed as 65 (clearly he was older) and Nancy Whittaker, age 27 was filed in 1896. They had 2 children. How bout them Mullins men? The above events could not have come to light without the help of Tara Wallace and Carol Anderson, both, very fine researchers in their own right. My sincere thanks.